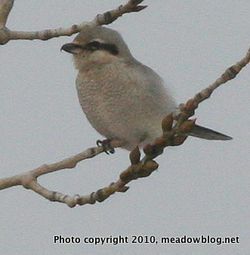 Ron Shields had the Northern Shrike at the back of the Retention Pond by Disposal Road from roughly 3:30 to 4 p.m. today. Ron called me in time for me to take a lot of photos from across the pond, in not-so-hot light. 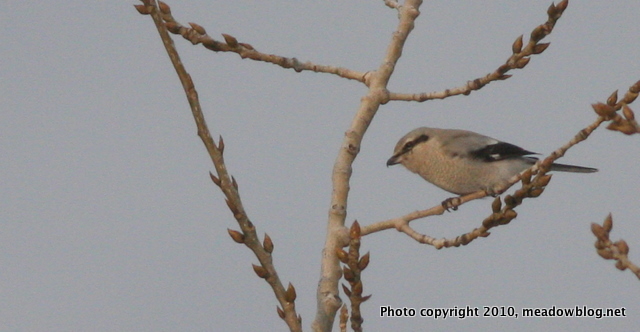 The Northern Shrike continues on Disposal Road and now DeKorte Park. It was seen on the Saw Mill Creek Trail this morning after it made a brief stop at the Cedars near the Carillon. Chris Takacs says: "We noticed the bird when the local Mockingbird began to complain –something to look for when searching for this guy." It was seen Thursday several times — in the morning, mid-afternoon and late afternoon. The bird has now hung around for 29 days. A big thank you to all the birders who have been looking for (and finding) this bird. If anyone has good new photos, we'd love to post them. In a report in its February 2010 issue, the popular national magazine made special note of DeKorte Park’s abundant winged wonders – from owls and other raptors in winter to butterflies and egrets in summer – and also praised the park’s well-maintained, family-friendly walkways and trails. The issue went on sale this week. 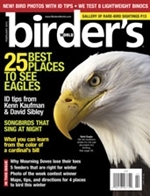 Click here>>>>Download Birder’s World Hotspot- DeKorte Park to see the one-page article. Click here to explore the Birder’s World Web Site. Click here to read The Record’s story on the news. Click “Continue reading…” for more information. 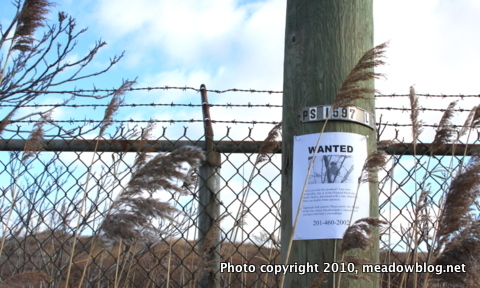 The Northern Shrike is now officially on the 10 Most Wanted List of Meadowlands birders, and we have posted a "Wanted Poster" on Disposal Road to that effect. Click here >>>Download WANTED to read the poster.